There is no literature written about the origin of this festival. Tradition says Hiraka Gennai, a scientist in the Edo era, brought paper balloons as a recreation, applying the principle of fire balloons, when he visited this area to give technical guidance on the copper mine. The festival is cast as a heritage of ethnic religion as it was previously practiced simultaneously with “Mushi Yaki” (set fire on paddy straws piled up in rice fields, also called “Don-to Yaki” or “Tempitsu”) in order to pray for bumper crops and well-being of one’s household. Although the festival was suspended during the war time, volunteers in Kamihinokinai dedicated to revive the festival in Miyata in 1974. 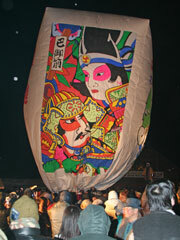 Now the festival has become one of the representative winter festivals in Akita prefecture. Paper balloons are literally made of paper. Japanese writing paper was once used, however, industrial Japanese paper with the width of about 1 meter has been used in recent years in response to the growing size of the balloons. The paper is glued together to make a cylindrical shape with the height of 3 to 8 meters (sometimes up to 12 meters). The top opening is sealed with a corresponding paper to make the heat stay in the balloon. Attach a bamboo loop of 1 to 3 meters long at the bottom opening. Finally, a source of lift called Tampo (cloth ball soaked with petroleum) is fixed into the loop. The production of paper balloons starts normally in December, which is 2 months before the actual festival day. In due time, the old and young of 8 districts in Kamihinokinai gather at each community center and work together to complete a series of operations such as cutting the paper, selection of pattern and drawing. Since Kamihinokinai is a close area, the major industry is rice cropping and forestry work. Thus the festival was often used as a way to pray for bumper crops and perfect state of health. In recent years, however, the well-being of households, prosperity in businesses, safe driving, and success in examinations are also prayed for. Each person in the community conveys one’s thoughts and hopes to the paper balloons and sets them off into the night sky in the deep of winter so they reach to the heaven. Copyright © 2018 Akita Semboku City. All Rights Reserved.